With its modern, angular appearance, the Corsair SPEC-ALPHA really stands out in a crowd. With immaculate tempered glass enclosing the entire chassis, every component of your build is on display for all to see, including three vivid SP120 RGB LED fans and a built-in LED controller. Its open-frame and full 360 degree free-rotating design provides the ultimate flexibility for professional users. The X-Frame 2.0 is bundled with an In Win branded signature power supply, the SI-1065W. Introducing the H-Frame 2.0 which has been developed in honor of In Win’s 30th anniversary. Luminous LED lights embellish the edges of the outer aluminium blades. The radiant, innovative layered aluminium structure refines In Win’s signature look. Lian-li PC-Q25 cube chassis is a small form factor chassis with a elegant simplistic design. Put your build on display through beautiful two-panel tempered glass and keep it all running cool and quiet with 3 RGB fans and Direct Airflow technology. The Carbide Series SPEC-OMEGA is a mid-tower PC case with striking angular looks, unique tempered glass front and side panels and Direct Airflow Path cooling layout. 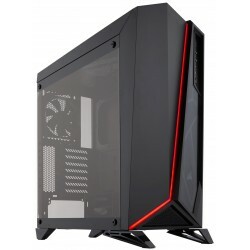 Dimensions W: 210mm H: 334mm D: 372mm (without feet)/W: 210mm H: 349mm D: 372mm (with feet)/Material(s) SECC Steel and Tempered Glass/Weight 6.0 kg/Motherboard Support mini-ITX/Expansion Slots 2/I/O Ports 2 x USB 3.1 Gen 1/Drive Bays 2.5? : 3+1 3.5?